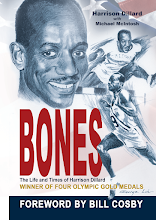 As 5-2 Frances Koons looked back over her athletic career and the obstacles she later faced, the eight-time All-America in track and cross country from Villanova realized that it was not just the length of her legs that carried her to stardom but the size of her heart. "And probably a good set of lungs, some genetics and some hard work played into that, too," said Koons, 23. "So I guess I have just been really blessed with all of that." Blessed is a word with which Koons has more than a passing acquaintance. Diagnosed during the summer of 2007 with clear-cell renal carcinoma - a form of kidney cancer typically found in people over 40 who are heavy smokers, obese or have high blood pressure - Koons had successful surgery to remove the tumor and has since resumed her training regimen with the hope of qualifying for the 2012 London Olympics. 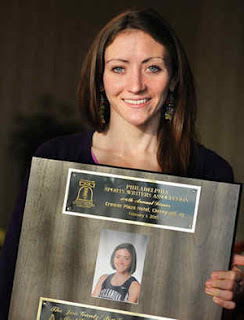 In recognition of her fortitude in overcoming a potentially deadly illness, Koons was announced yesterday as the winner of the 2010 Most Courageous Athlete Award by the Philadelphia Sports Writers. The association honored her last night at their 106th annual dinner at the Crowne Plaza in Cherry Hill. She said at the press conference before the event that she was "truly humbled." "I am so just deeply honored," she said. "It is kind of an amazing award to get. I was really surprised. Really special." Koons said she was "really surprised" when she received her cancer diagnosis. She remembered that she had "no blatant symptoms," only "the feeling that something was off" physically as she went through her rigorous training program. While she said the doctors told her they were 95 percent sure she had kidney cancer, Koons said they explained that they could not be 100 percent sure until they performed surgery. That occurred in August 2007, and doctors verified the cancer. Koons said it was a "quick turnaround" between her diagnosis and being cancer-free. They immediately removed the tumor with minimally invasive laparoscopic surgery and, she said, "They got all of it." She said she is lucky doctors found it when they did. "[The doctors] just happened to find it," said Koons, who starred at Villanova between 2004 and '09. "It is a very slow-growing cancer and I was just really fortunate that I had doctors who caught it in the early stages. Once it metastasizes, kidney cancer has a really tough prognosis." Koons has had a stellar career, during which she was named 2006 NCAA Mid-Atlantic regional cross country athlete of the year. Unable to perform for a year in the wake of her surgery, she reached the semifinals in the 1,500-meter run at the 2008 Olympic trials. She said she experienced a deep level of joy being able to compete again. "When you put hard work into something and you have something successful come out of it, you know you are going to be happy with that," Koons said. "But when you have a life-altering [event], you appreciate it that much more. I kind of savor the experience." Koons said her ordeal has changed her perspective on competition. "It has made me more care-free about running," said Koons, who attended Allentown Central Catholic High. "There is not as much weight on your shoulders, because you know there are a lot more important things in life." 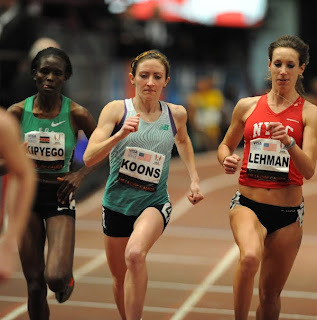 Koons said the support she has received from the running community was "pretty phenomenal." She called it "awesome medicine." But she also has reached out to other athletes she heard from who have had medical problems, including a woman from the University of Minnesota who had brain cancer and is now cancer-free. Doing so has allowed her to connect with the human spirit of others, which she says inspires and humbles her. She said she hopes to be a spokeswoman for kidney research. Koons said she has to have annual checkups, but said the doctors have told her they do not expect the cancer to come back. With a degree in mathematics, she is now finishing work at Villanova on her master's degree in applied statistics, which she said could lead to a career with a pharmaceutical company or medical research. She also hopes to participate in the schedule of events leading up to the 2012 London Olympics. She does not consider herself "courageous." She thinks of her brother when she thinks of that word. Sgt. Frederick Koons is scheduled to go back to Iraq or Afghanistan in the spring. "Courage is the men and women fighting in Iraq and Afghanistan, the people helping in Haiti right now," she said. "That is on a bigger level. But on a more micro-level in our lives, we can be courageous in our personal relationships. Or just sending a smile to someone when they are down . . . Everyone is capable of being courageous in their own way."